It sounds pretty corny, but I think it’s a point that’s often lost with events. Honoring the attendee – the fact that they’re spending their time and attention on your event means you owe it to them to have the best event possible. While I’ve talked a bit already about content, planning and such, I think another piece that is often overlooked is the presentation of that content. OK, so it’s a weak analogy, but bear with me a bit. So many times when you attend a webcast or virtual conference, you get to watch a PowerPoint slide and listen to someone reading you the contents of the slide. It’s pretty crazy to think that that requires a webcast or virtual event. The point of a presentation is to have the presenter embellish on the content shown. Add to it, enhance it. Show a demonstration. Have a discussion. I know, it’s pretty one-sided when you’re doing a presentation but actually looking to have a conversation with your attendees, providing information they can’t get from reading the slides, talking clearly and honestly… all of these, combined with your Q&A, mean you’re having a discussion with them. Think about you sitting in the audience. Would you want what you’re showing/providing/talking about? If not, it’s time to re-think your presentation approach. Sure, slides are key to a solid presentation in many cases. It gives the attendee a reference point, it gives you talking points and some people are visual and just really need to see it to get it. But consider having different types of information presented, perhaps a graph on the slide, then talk about the numbers in your presentation and offer a spreadsheet download of the factual backup details. Don’t just read the slide, talk about the why and how, use the slides to show the what. If you think about it, movies, TV, webcasting, virtual conference sessions… it’s all about storytelling. You’re passing along knowledge of an experience, a happening, something you’ve learned that you want to share. Storytelling has evolved online and moved beyond 6 bullet points and 6 words. As you build your presentation, think of slides as backup information, downloads as the details and your verbal presentation is your story – the meat of the presentation. By providing information that isn’t redundant, that is in different forms that people can ingest and by providing it in a way that can be best understood, you honor that attendee. 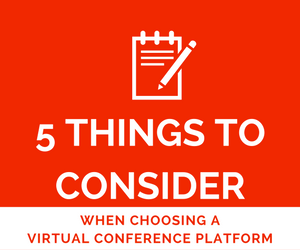 You make it worth their time to attend your session, webcast or virtual conference. It’s important to keep that in mind, and keep your attendee’s goals in mind for your event. To learn about what you have to present. They want to hear and learn from your story!